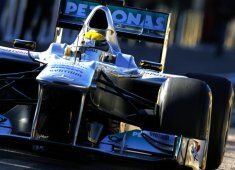 Both Mercedes GP drivers endured difficult races at the Korean GP today. Nico Rosberg finished the Korean Grand Prix in eighth place today with team-mate Michael Schumacher forced to retire on lap 16 after getting hit by Vitaly Petrov. "I had good speed at the start of the race today but after we changed to the prime tyres, it became more difficult as the degradation was too strong. I had some nice battles against Jenson and the Ferraris, and was pushing hard to defend my position against Felipe and Fernando in the middle stint. During this, I flat-spotted my front tyres so I had to pit earlier than expected which made my last stint on the primes very long. I didn't have enough grip by the end and so I just wasn't able to defend the position against Jaime. A difficult race for me today but I'm still happy to score some points." "Another unfortunate end to a race which could have been encouraging today. It's a big pity as the car was again very good in race trim and I had already gained some positions. It would have been interesting to see what was possible, and I think we could certainly have taken some points. As for the incident, I didn't see Vitaly coming; I was just suddenly spun into a direction I had not intended to go, and then I saw my rear wing hanging off. It was unfortunate but these things happen when you fight hard - that's racing." "The early stages of the race looked encouraging and both drivers were making good progress on the option tyres, with Nico fighting among the top three teams and jumping the Ferraris thanks to more strong pit work. We fitted prime tyres to both cars at the first stop in order to ensure we could complete a two-stop race - something that would have been marginal if we had run options in the second stint. Nico was driving well but had a big flat spot on his left-front tyre on lap 27, which forced him to pit out of sequence for another set of primes. From that point on, he had to nurse the tyres for over half the race distance to the flag. He did this extremely well, climbing back from P14 to P7, but was unable to hold off Alguersuari on the final lap, whose tyres were ten laps fresher. As for Michael's incident, he was driving well, making up positions and minding his own business when somebody simply forgot to brake at turn three. Although we didn't score points to our full potential today, there were encouraging signs of our competitiveness for the remaining three races of the season, and we will aim to build on this in India - which will be a new adventure for us all." "Our race started well, with Nico lying fifth after the first round of stops and ahead of both Ferraris, and he had some thrilling battles with Jenson Button, the winner of the last race. The end of Nico's race was less satisfying. He came in early after flat spotting his front left tyre, had to do a very long third stint and was overtaken on the very last lap courtesy of DRS. Michael drove strongly from 12th on the grid, fighting his way through the field and running ahead of Alonso's Ferrari when he was taken out by a very optimistic competitor. Our team can take some positives from this weekend as the beginning of the race with heavy fuel loads on the softest tyre looked strong - something we struggled with earlier in the season. Our learning process is certainly guiding us in the right direction, which is one of the targets we set ourselves. Lewis Hamilton's second place is the 100th podium finish in 105 races for our V8 engine, which has won 34 times in the last 86 races. Well done to all our colleagues at Mercedes-Benz HighPerformanceEngines in Brixworth for reaching this milestone. Now we are all looking forward to the inaugural Indian Grand Prix in a fortnight."